This testimony by Patrick Michaels, then Senior Fellow of Environmental studies at the Cato Institute, was used as expert opinion by Western Fuels Association (“WFA”) before the Minnesota Public Utilities Commission. The hearing was in St. Paul, Minnesota to determine the environmental cost of coal burning power plants in the state. Richard Lindzen, Robert Balling, and Keith Idso, noted climate deniers with industry ties, also testified on behalf of WFA. In this testimony, Michaels was questioned by Barbara Freese, Assistant Attorney General for Minnesota, about the causes and effects of global climate change. Michaels agreed that “the earth will undergo some warming as a result of the increase in anthropogenerated greenhouse gases,” but contested that science as a whole has undergone “an unfortunate politicization” when it comes to climate change. Michaels is also questioned on the scope and consistency of his research on contributions to climate change. 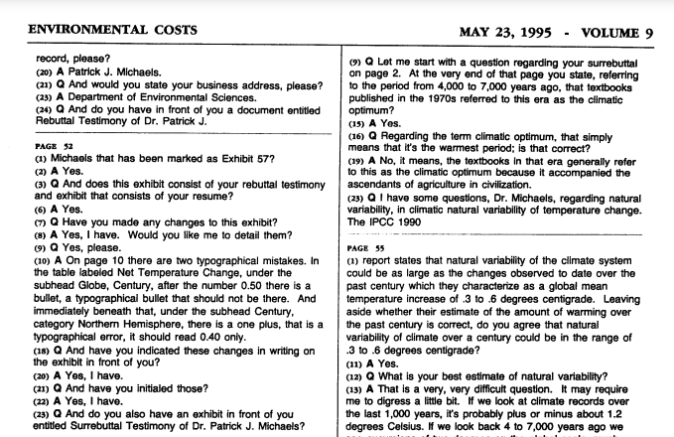 As an “example of a commentary on Mr. Michaels’ methodological approaches,” Freese asks Michaels why he “only used winter data as opposed to the total data attempted to be collected by [climate researchers] Kerr and McGelroy.” Peter Glaser, counsel for WFA, objected to the question on the grounds of relevance. The objection was sustained.